The last time you put something together with your hands, whether it was buttoning your shirt or rebuilding your clutch, you used your sense of touch more than you might think. 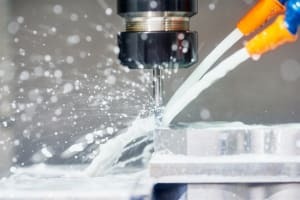 Advanced measurement tools such as gauge blocks, verniers and even coordinate-measuring machines (CMMs) exist to detect minute differences in dimension, but we instinctively use our fingertips to check if two surfaces are flush. 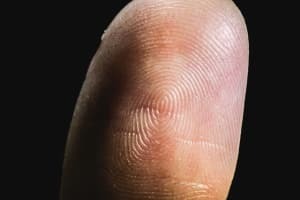 In fact, a 2013 study found that the human sense of touch can even detect Nano-scale wrinkles on an otherwise smooth surface. 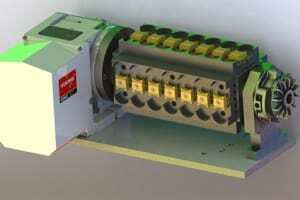 Here’s another example from the machining world: the surface comparator. 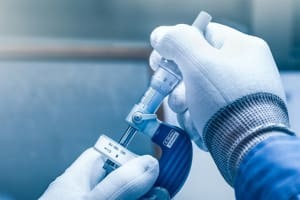 It’s a visual tool for analyzing the finish of a surface, however, it’s natural to touch and feel the surface of your part when checking the finish. 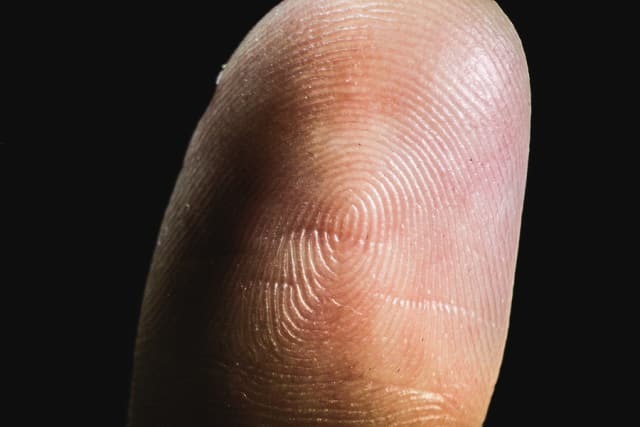 Our brains are wired to use the information from not only our eyes but also from our finely calibrated touch sensors. While there are several mechanisms by which forces are converted to electrical signal, the main parts of a force and torque sensor are the same. Two outer frames, typically made of aluminum or steel, carry the mounting points, typically threaded holes. All axes of measured force can be measured as one frame acting on the other. The frames enclose the sensor mechanisms and any onboard logic for signal encoding. 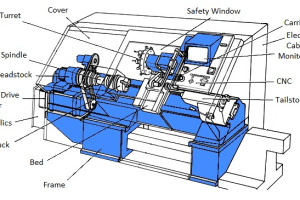 The most common mechanism in six-axis sensors is the strain gauge. Strain gauges consist of a thin conductor, typically metal foil, arranged in a specific pattern on a flexible substrate. Due to the properties of electrical resistance, applied mechanical stress deforms the conductor, making it longer and thinner. The resulting change in electrical resistance can be measured. These delicate mechanisms can be easily damaged by overloading, as the deformation of the conductor can exceed the elasticity of the material and cause it to break or become permanently deformed, destroying the calibration. However, this risk is typically protected by the design of the sensor device. 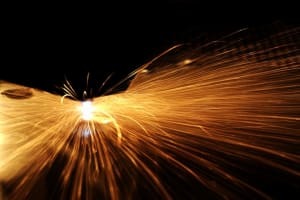 While the ductility of metal foils once made them the standard material for strain gauges, p-doped silicon has proven to show a much higher signal-to-noise ratio. For this reason, semiconductor strain gauges are becoming more popular. For example, all of ATI Industrial Automation’s six-axis sensors use silicon strain gauge technology. Strain gauges measure force in one direction—the force oriented parallel to the paths in the gauge. These long paths are designed to amplify the deformation and thus the change in electrical resistance. 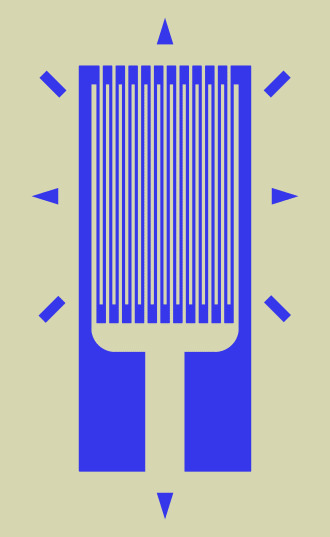 Strain gauges are not sensitive to lateral deformation. 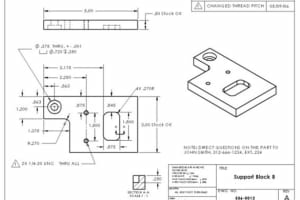 For this reason, six-axis sensor designs typically include several gauges, including multiple per axis. 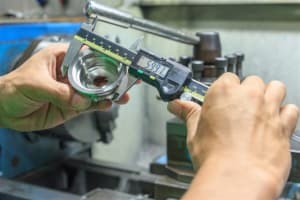 There are some alternatives to the strain gauge for sensor manufacturers. 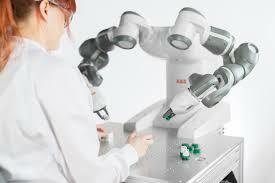 For example, Robotiq created a patented capacitive mechanism at the core of its six-axis sensors. 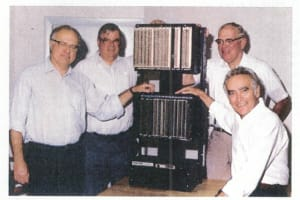 The goal of creating a new type of sensor mechanism was to create a way to measure the data digitally, instead of as an analog signal, and reduce noise. 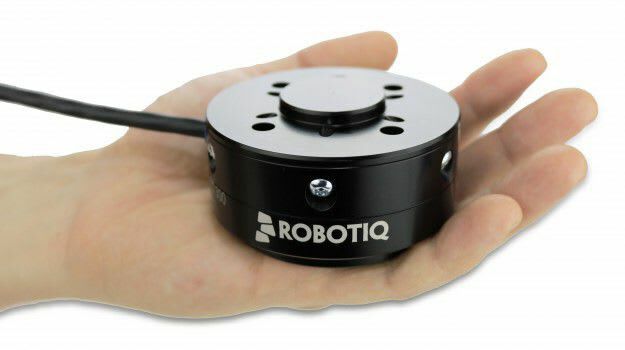 So, how does Robotiq’s patented sensor work? 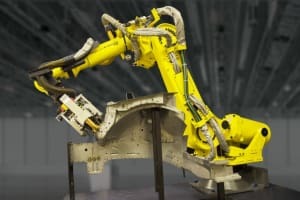 Given the value of our human sense of touch to our motor and analytical skills, the immense potential for advanced touch and force sensing on industrial robots is obvious. Force and torque sensing already is in use in the field of collaborative robotics. Collaborative robots detect collision and can pause or slow their programmed path of motion accordingly. This makes them capable of working in contact with humans. However, much of this type of sensing is done via the feedback current of the motor. When there is a physical force opposing the rotation of the motor, the feedback current increases. This change can be detected. However, the applied force cannot be measured accurately using this method. For more detailed tasks, a force/torque sensor is needed. 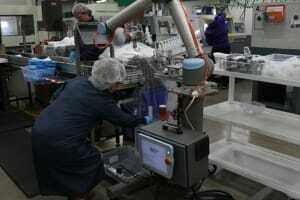 Ultimately, industrial robotics is about efficiency. 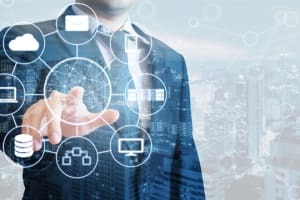 At trade shows and in vendor showrooms, we see a lot of high-tech bells and whistles designed to make robots smarter and more capable, but on the bottom line, savvy customers only buy as much robot as they need. So, does your robot need a force and torque sensor? 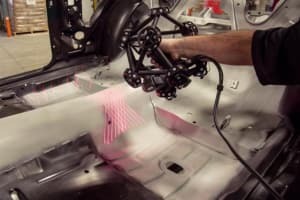 Do Collaborative Robots Really Need Multi-axis Sensors? Cobots, by definition, are equipped to sense and react to forces acting on them. So, do they really require more dedicated sensors to do essentially the same thing? Charles Haines, ATI marketing manager, agreed. 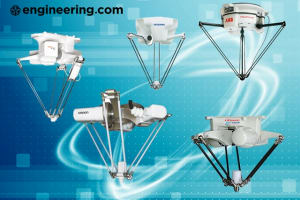 The FT 300 is a six-axis force and torque sensor designed for robotics applications. 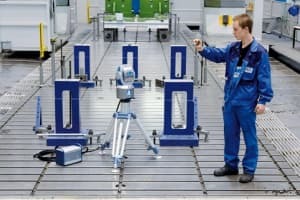 With a max measuring range of +/-300N and +/-30Nm in each axis, the specs are aligned with most of the robots in the 5-10 kilo payload range. It’s designed to be used in such robot applications. 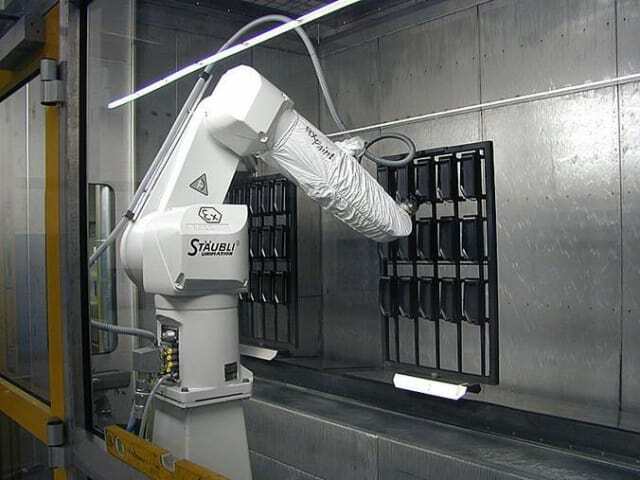 Grinding, polishing and other finishing tasks are common-use cases for force and torque sensor-enabled robots. Using abrasive tools requires accurate application of force, which can be difficult to do using programmed waypoints. For example, when sanding a wood or composite surface, too much pressure may sand too aggressively and put unnecessary stress on the motors. Too little pressure and the sanding task will not be completed adequately. 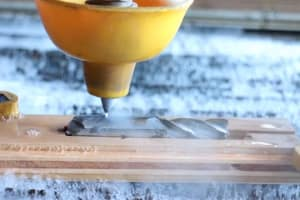 Further complicating things, the process of sanding lowers the height of the surface, making coordinate or path-based programming difficult. With a force and torque sensor, the robot’s programming can measure the force applied by the arm to the surface and maintain a consistent force. This provides greater repeatability in these types of processes. 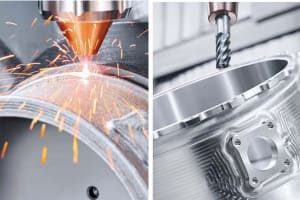 “In robotics applications, six-axis sensors can be used in material removal like grinding or polishing, where you’re trying to measure just how much force you’re applying as you’re grinding the material,” Haines said. 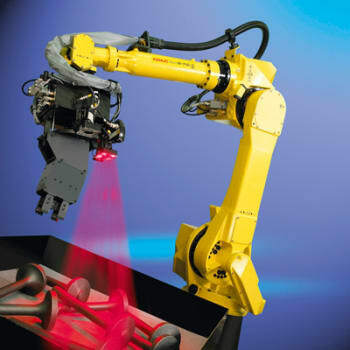 Automated packing is a market dominated by vision systems, but force and torque sensing robots are capable of tight-tolerance packing and packing of fragile materials. 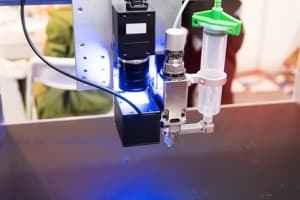 The additional data provided by the sensor allows the robot to detect the bottom and sides of the packaging, offering greater programming flexibility and repeatability. For example, parts could be reliably placed in a thin-walled box that changes shape or shifts position as parts are added to it. 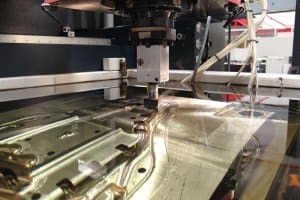 A robot equipped with a six-axis sensor could be in service tending a computer numerical control (CNC) milling machine. 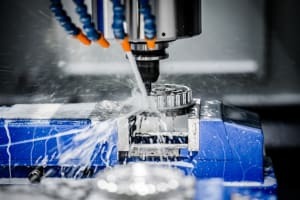 Parts could be placed on a tray together, from billet stock to finished parts, and the robot could run the correct milling operation on a given part based on the sensed weight—as the weight changes to a specific value with each subsequent cutting operation. This hypothetical example demonstrates the flexibility and repeatability afforded by force torque sensor-enabled robots. The automation poster-child is the robot that takes over a repetitive, labor-intensive task, freeing up a human worker for more valuable work. 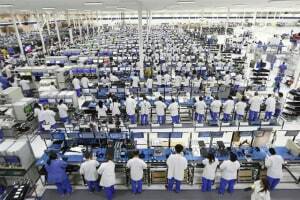 However, many assembly tasks are deemed too complicated or finicky for robotic automation. 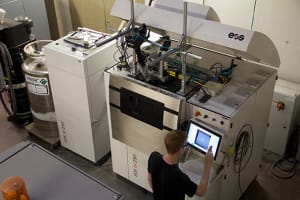 Tasks such as precisely torqued screw assembly, mating surfaces and tight-tolerance insertion are bastions of human skill in the assembly world. But human assemblers no longer have a monopoly on the sense of touch. 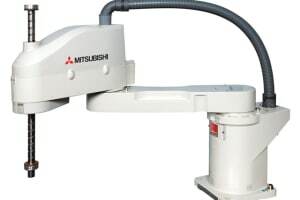 According to Robotiq’s FT300 application table, robots equipped with the FT 300, or comparable sensor products such as the ATI Axia80, can precisely perform tasks such as installing a screw without cross-threading and fastening it to the specified torque. 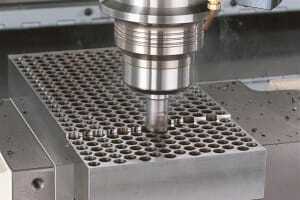 It also can insert tight-tolerance pins or assemblies together without requiring high-precision fixturing. “Six-axis sensors are ideal for assembly applications in which you may need to know how much force you’re exerting on the components. 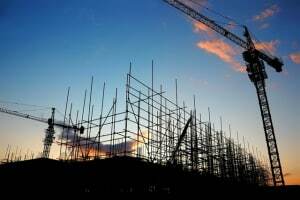 For example, avoiding cross-threading of screws,” Haines said. Overall, the added functionality of the force torque sensor makes programming your robot more flexible, repeatable and robust for many tasks. 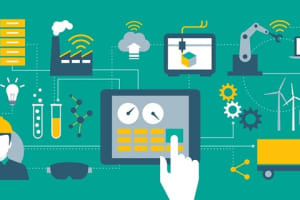 If you’re looking for a six-axis sensor for research, testing or measurement applications, the considerations are different than for industrial automation. 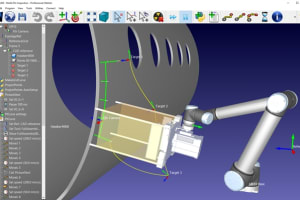 For example, devices like the Robotiq FT 300 or the ATI Axia80 have form factors designed to fit at the wrist joint of an industrial robot, which must be adapted for your test stand or apparatus. Of course, the diameter of your sensor is an important factor. 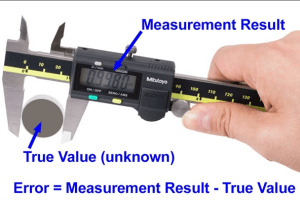 Generally, device diameter goes hand in hand with measurement range. 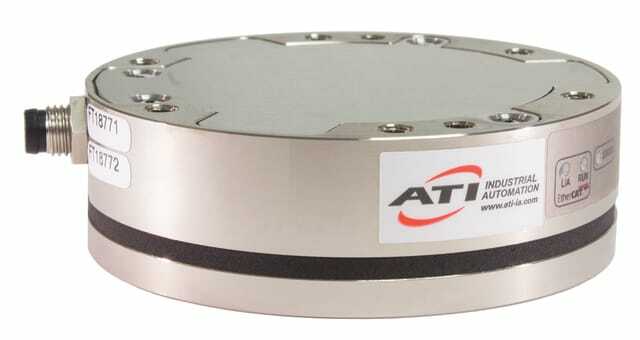 For example, ATI sells the smallest six-axis sensor on the market, the 17mm Nano17, which can be calibrated to measure up to 17lbf in Fz, for example—other calibrations are available. At the other end of the spectrum, ATI’s largest sensor, the Omega331, measures up to 21,000lbf in the same axis. This sensor is 330mm in diameter or about 12in. 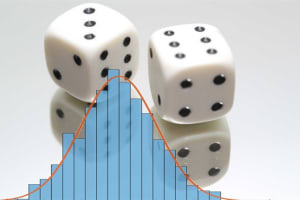 Compared to robotics applications, test applications have the advantage of being better able to predict the range of forces the sensor will need to read and withstand. According to Haines, the plug-and-play versatility and robustness of ATI’s sensor products makes them ideal for unpredictable environments. Haines brings up an important point, which is that the measurement range and overload protection of the sensor you select should be dictated by your use case requirements. 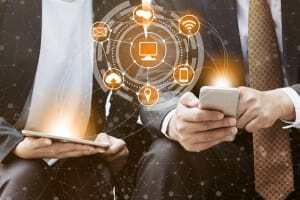 On the other hand, Mark Minda, HBM Inc. business development manager, brings up a counterpoint: If your application requires a high degree of sensitivity, the sensor you buy is likely to be more fragile. 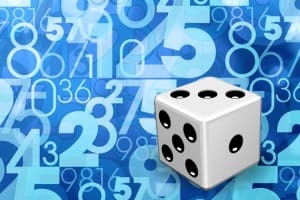 He put it in simple terms: “When you make something more robust, it has to be bigger. When it becomes bigger, it becomes less sensitive. It’s a trade-off—generally, more overload protection equals less sensitivity at the low end.” If the risk of overload is a known quantity, it may be worth choosing a less robust, more sensitive sensor. 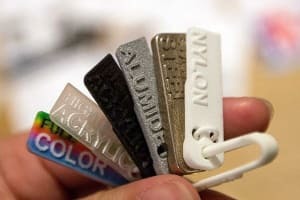 Whether your sensor costs $100 or $10,000, you’re definitely looking at the risks of dirt, moisture and contaminants such as grease or paint getting at the device. The good news is that most devices can withstand harsh and dirty environments. ATI offers sensor models up to IP68, which certifies water resistance down to 1m submersion. They’re also planning to take environmental resistance one giant step further. “We’re working on sensors to be used in space. An example use case could be for a door hatch—knowing exactly how much force is being exerted to open that mechanism or a rover on mars drilling for samples, seeking to log how much force is being exerted by that drilling process,” Haines said. As mentioned above, the most important problem to watch out for is overloading. Overloading a sensor can fry the device completely or destroy the accuracy and even repeatability of your sensor readings. 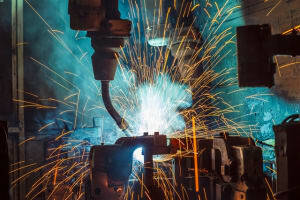 This can be especially dangerous in applications where the sensor is used to regulate the amount of force exerted, such as robotics or stress testing. 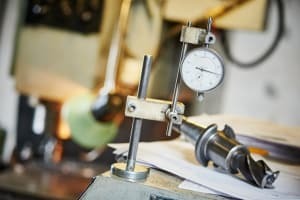 Dealing with sensitive, fragile components can be tricky. When installing a delicate sensor, it’s important to take precautions. Many sensors have threaded mounting holes, which can be used during transportation and installation to avoid damaging the internal components. If you’re not sure what overload protection you should specify, all major sensor manufacturers can help via in-house applications engineers. You should always contact an expert before selecting a sensor. While six-axis sensors are designed to measure forces on all six axes, sometimes a force in one axis can cause force in another axis. This phenomenon is known as crosstalk. 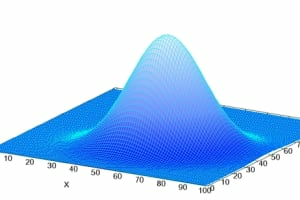 A simple example of this could be a box resting on a sloped surface. Downward force on the box is partially translated to a lateral force, as the box slides down the hill. The same basic principle applies to multi-axis sensors. For this reason, it’s critical to ensure the force acting on the sensor is aligned with the correct axis of the sensor. 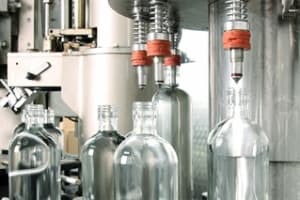 While sensor manufacturers design devices to minimize the risk of off-axis loading and crosstalk, it’s ultimately up to the designer of the test stand, apparatus, fixturing or mounting adapter to reduce crosstalk and off-axis loading. If you apply a force to a sensor that increases at a constant rate, the graph of force applied over time will be a linear function. The degree to which sensor output deviates from this line is known as linearity—or nonlinearity, depending on who you ask. Linearity is listed as a percentage on device datasheets. It’s typically under 5 percent. 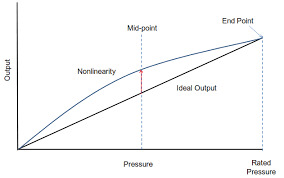 Linearity can stem from various minor factors, including the material properties of the device components. 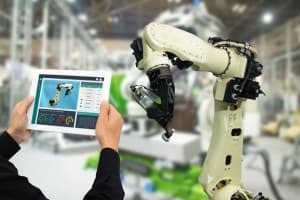 By this point, you may be convinced that touch sensors are a critical component for unlocking a greater range of capabilities in industrial robots. 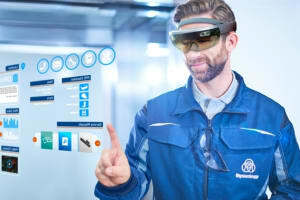 But if you’ve seen a line of high-speed delta robots performing as many as 300 picks per minute on a pick and place line, you’re probably skeptical of the notion that the sense of touch can ever fully replace a 3D or even a simple 2D vision system. If so, Jobin of Robotiq agrees with you. Like many robotics technologies, we can learn from nature. 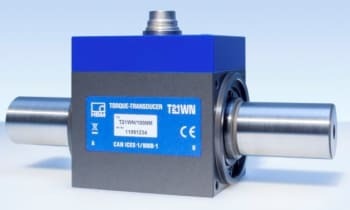 Six-axis force torque sensors are specialized devices designed for a range of complex sensing tasks. In many cases, it may be too much sensor for your needs or the wrong type of torque sensor. If you need to measure the torque applied by a spinning powertrain driveshaft, Minda is your guy. 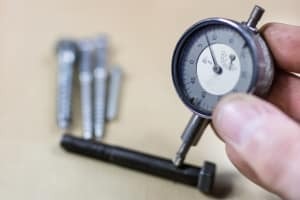 HBM specializes in rotating torque sensors, but his insight was featured in this piece because many of the principles and practices are the same. If you need to sense applied force in one or two axes, consider using multiple load cells. For example, if you are a zoologist measuring the force applied by a dolphin to an aquarium window, it may be more useful to avoid the complexity of six-axis sensor data and isolate the force applied in the axis perpendicular to the glass. Another use case for a load cell could be simple weighing or presence sensing on a conveyor. 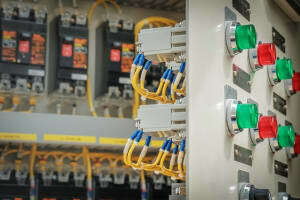 Load cells are available from electronic component manufacturers like OMEGA. What range of forces can the sensor measure? Several of the sensors on the market today take a hockey puck-like form, ideal for installation at the wrist of a robot. However, you should consider whether the form factor of your sensor will work with your setup. Remember that devices generally get larger as their sensing range increases. Some sensors, such as the ATI Axia80, are available with several data buses including ethernet, etherCAT and USB. However, always check to ensure you can work with the bus a sensor uses. For more informative and inspiring stories like this, sign up for our weekly communique. Written by our own Ian Wright, the Engineer’s Picks communique delivers our top stories to your inbox each week. Click here to sign up.